This wrap is amazing!! I took it from “The Best of Rose Reisman – 20 years of healthy recipes”. In her notes, Reisman states that a Cobb salad traditionally has chicken, blue cheese, bacon and heavy dressing…this is her lightened up version made into a wrap. 1. Lightly coat a nonstick grill pan with vegetable spray and set over medium heat. Grill the chicken for 4 minutes on each side or until no longer pink. Cool slightly, then slice thinly. 2. Combine the tomatoes, red pepper, avocado, black beans, green onions and parsley in a large bowl. Add the lemon juice, sour cream, olive oil, garlic, chili sauce and salt and pepper and mix well. 3. Spread half of each tortilla with some of the tomato mixture. Top with slices of chicken and the shredded cheese. Fold the 2 sides in and roll up. 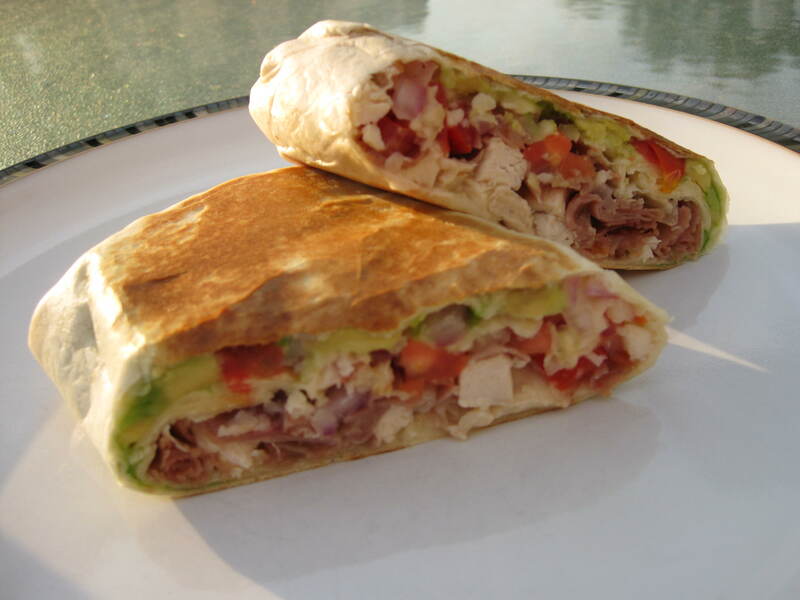 Place the wraps in a clean grill pan and cook for 5 minutes, turning halfway, just enough to warm through. (Or heat in a 400F/200C oven for 5 minutes until warm.). Cut in half and serve. 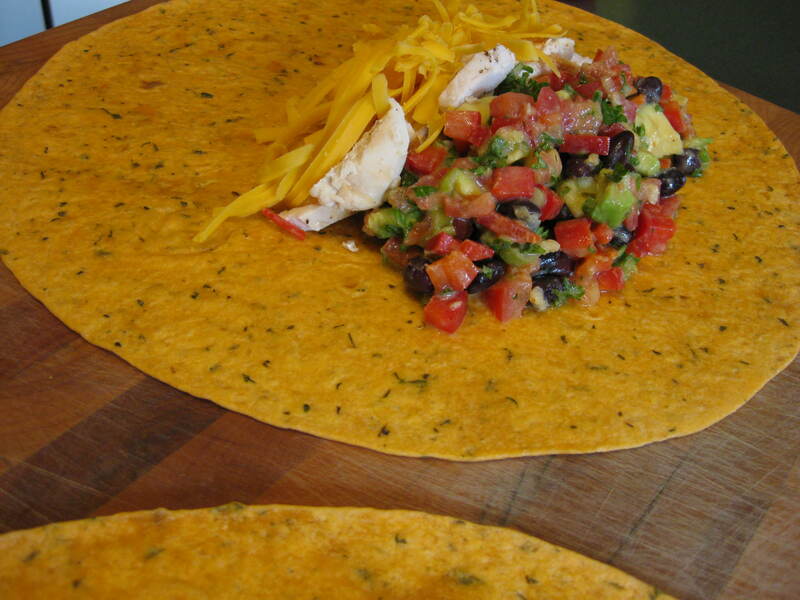 Make ahead: Make wraps up to 2 hours in advance. Cover and refrigerate. 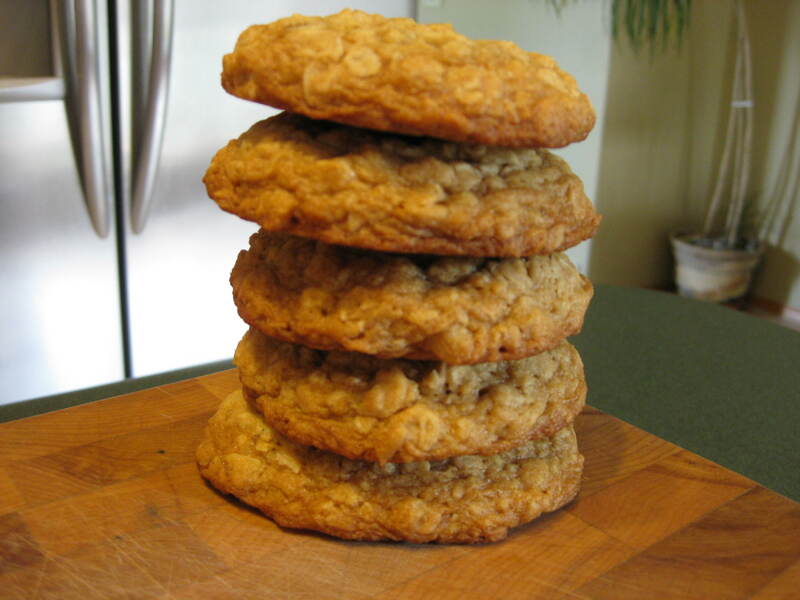 This is an AWESOME oatmeal cookie! A friend passed along this recipe from thepioneerwoman.com. 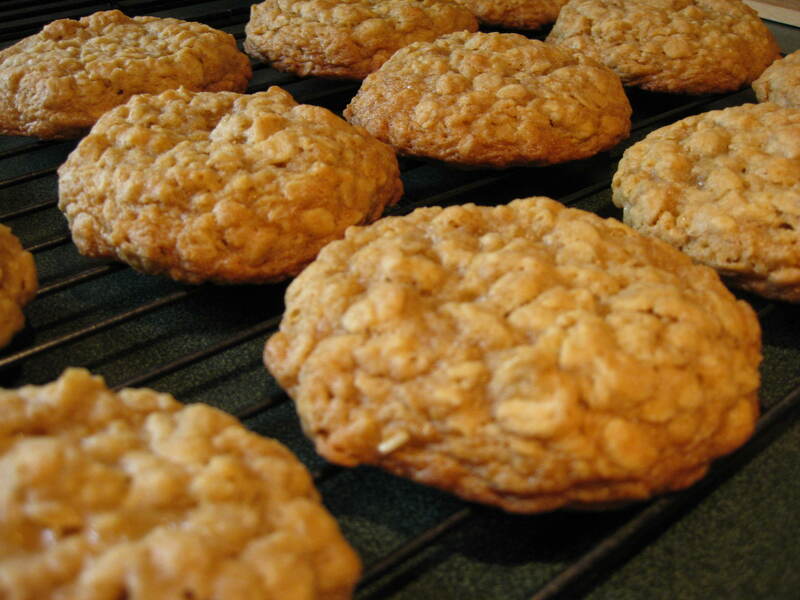 I used large flake oats and I baked my cookies for 12 minutes and no longer. I also eliminated the salt. 2. In the bowl of an electric mixer (or using a hand mixer) beat together the butter and brown sugar until fluffy. Beat in vanilla. Add eggs, one at a time, scraping the bowl after each one. 3. Mix together the flour, salt, and baking soda in a medium sized bowl. Add it into the creamed mixture in 2 to 3 batches, mixing it until just combined. Mix in the oats until just combined. 4. Use your preferred size cookie scoop (or a regular spoon) to drop portions of dough onto a lightly greased cookie sheet, spacing them a couple inches apart. Bake for 12-13 minutes or until dark and chewy. If you’d like a crispier cookie, just cook a little longer! 5. Let them cool slightly on the pan after removing from the oven, then transfer the cookies onto a plate for serving. *Note: Add 1/2 cup finely chopped nuts to the flour mixture if you’d like a nutty flavor and crunch. You have to make this panini!!! I took this recipe from “The Best of Rose Reisman – 20 years of healthy recipes” by Rose Reisman. I do not have a panini press so I use a large skillet and press down on the wrap with a smaller skillet. 1. Spray a nonstick skillet with cooking oil and place over medium heat. Sauté the prosciutto for 5 minutes or just until dry and beginning to crisp. Remove from the pan, cool slightly and crumble. Wipe the skillet and respray. 2. Working with one at a time, pound the chicken breasts between two sheets of waxed paper to an even 1/4-inch (6 mm) thickness. Sauté the chicken for 5 minutes, or just until cooked and no longer pink in the centre, turning halfway. Cool for 5 minutes, then dice. 3. Combine the mayonnaise, lemon juice, mustard, garlic and pepper in a small bowl and mix thoroughly. Spread evenly over the entire surface of the tortillas. 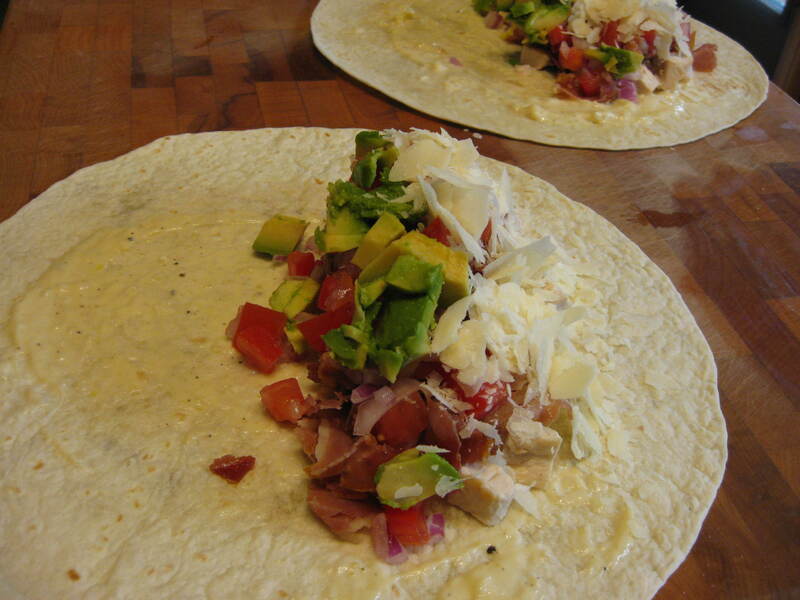 Scatter the chicken, prosciutto, cheese, tomato, onion and avocado overtop. 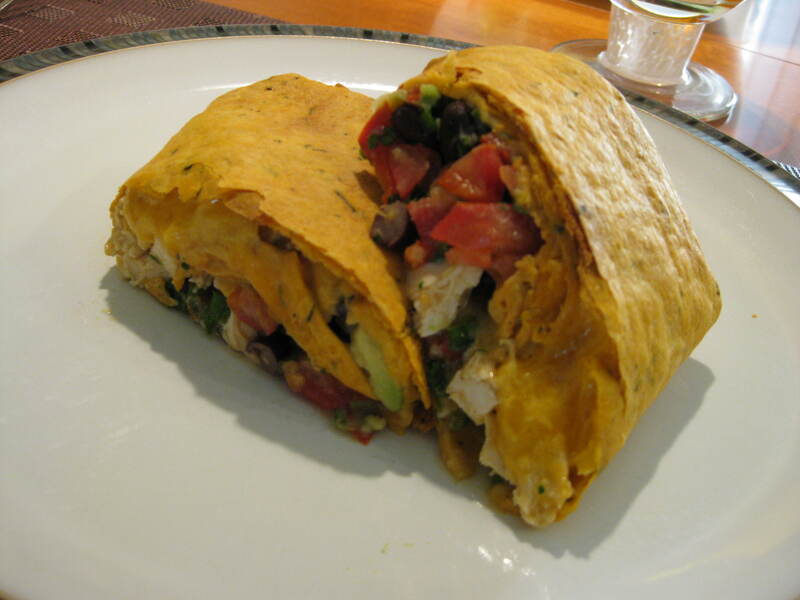 Fold in the sides of each tortilla and roll it up tightly. 4. Preheat a nonstick grill pan to hot and spray with cooking oil. Sear the rolls on both sides until browned, approximately 2 minutes per side. Slice in half before serving. Make ahead – Make the panini early in the day. Cover and refrigerate and heat just before serving.